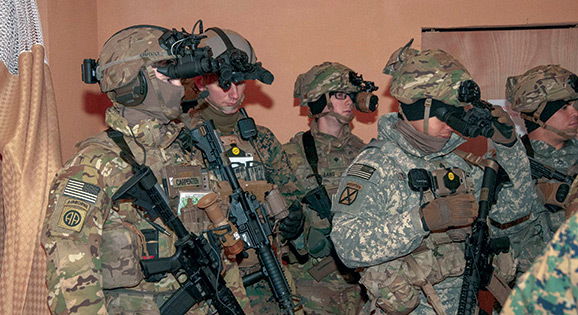 The cold and snow in the marshlands of Aberdeen Proving Ground, Maryland, could not keep Program Executive Office Soldier from conducting a Soldier Touch Point on the Enhanced Night Vision Goggle-Binocular. The STP included Soldiers from Bravo Company, 2nd Battalion, 504th Parachute Infantry Regiment, 1st Brigade Combat Team, 82nd Airborne Division from Fort Bragg, North Carolina; and Marines from The Basic School, Quantico Marine Corps Base, Virginia. They subjected ENVG-Bs to a variety of scenarios to see how effectively they worked and aided the Soldiers. Captain Redmond said the Soldiers wore the ENVG-B while going through obstacle courses and a tunnel complex, and they also carried out weapons and reflexive firing with RTA. In additional, they conducted squad attacks with room clearing and a movement to contact. All testing occurred both day and night. ENVG-B employs both night vision and thermal-sensing capabilities. The use of white phosphorous tubes, as opposed to the previous green phosphorous tubes, means Soldiers no longer see a green-tinted image. They now see nearly as clearly as one sees normally. Marine Cpl. John T. Fenley said the ENVG-B is so clear he is able to read with them. Being binocular, it also provides users increased depth perception versus that which is offered from the traditional monocular view. One of the Soldiers participating was Staff Sgt. Tanner Trapp, who especially liked the ENVG-B and Family of Weapon Sight--Individual, or FWS-I. The FWS-I wirelessly transmits an image captured from a reticle mounted on the M4 Carbine to the ENVG-B. This allows the Soldier to see the carbine’s aim point in the ENVG-B. Using RTA, Soldiers are able to engage a target without having to bring the carbine to the standard shoulder firing position. This cuts down valuable reaction time to a threat. “Overall, I think it will make us more lethal,” Sergeant Trapp said. “That thing is phenomenal. The capability it provides is ridiculous.” He especially liked how the ENVG-B and FWS-I RTA bubble does not emit a light signature like the PEQ-15, which near-peers can see. During an After Action Review following a day of weapons zeroing on the range, vendors solicited feedback from Soldiers who are working on variants of the ENVG-B. This gave Soldiers the opportunity to bring up issues they discovered. They told engineers that the ENVG-B locking mechanism seems to come loose, and the release buttons are too close together. Soldiers noted that one side of the ENVG-B feels a bit heavier than the other. Because of this, helmet balance was off, affecting how the helmet sat on their head. Having the engineers present allowed the Soldiers to ask about addressing the issue. Nevertheless, the feedback was not one-way only, resulting in teaching moments. For example, one Soldier mentioned that the compass on the ENVG-B seemed to be off by four degrees. An engineer explained that the ENVG-B compass is set for true north, not magnetic north, as typical commercial compasses use. An engineer clarified that the augmented reality of ENVG-B would automatically account for the differences between Magnetic and True North. Finally, Marine Sgt. Peter J. Leon, The Basic School, said he liked the compass headings visible in his field of view with the ENVG-B. As a machine gunner, having a visible compass in his view while firing his weapon helps him to maintain the Minimum Safe Line that keeps him from endangering his fellow Marines. Previously, determining MSL meant he had to look down at a compass and determine the headings for the MSL. With each Soldier Touch Point and feedback from Soldiers and Marines, PEO Soldier learn more ways to make the ENVG-B into a device that will improve Soldier lethality. Russell Petcoff of PEO Soldier Public Affairs contributed to this article.